/ Modified dec 12, 2018 12:42 p.m.
Tucson Police Chief Chris Magnus, March 2017. Tucson Police Chief Chris Magnus told the members of the Senate Judiciary Committee Wednesday that relationship building is key to good police work. Magnus said officers must walk a fine line when doing their jobs and being part of the community. He said that is particularly true for TPD officers who work in a city with a large immigrant population. "We know that if people see us as the law enforcement that does immigration enforcement, they are going to be less likely to report crimes, to come forward as witnesses to crimes or even just to work with us to help prevent crimes," Magnus told Arizona Public Media on Thursday. 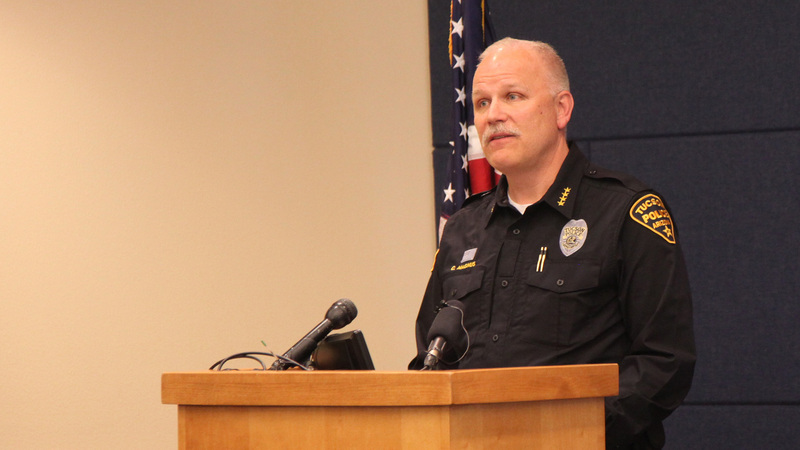 The chief was quick to add that the department is willing to work with federal law enforcement officers when it comes to drug enforcement, human trafficking or gang activity. He explained that immigration enforcement is not a top priority for TPD. "We want to be able to do public safety and crime fighting in a way that we think is most appropriate for our community and not be expected to take on added roles and responsibilities that really should be left with the federal government," said Magnus.